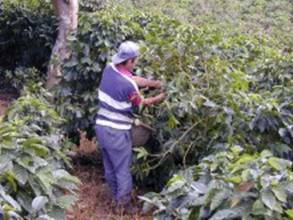 As part of the harvest of coffee beans knowledgeable workers select good mother plants and pick certain of the ripe cherries for their seeds. After being washed in clean water, the flesh of the cherries is pulped so the seeds can be extracted by hand. Don't destroy the pergamin-hull, but dry it 2-5 days in the sun. Then they plant the seeds in the sprouting beds. 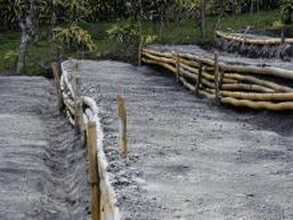 They are covered with around 1cm of fertile soil. It is important that the earth around the plants never dries out, but remains damp. 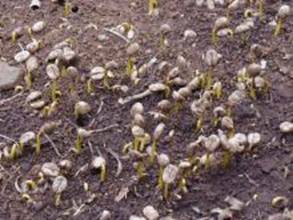 To augment this, the seedlings grow on a shady spot. 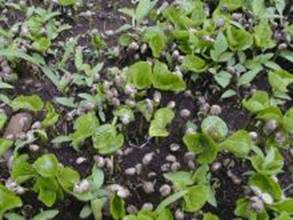 After 6-8 weeks, the seeds break out and soon sprout 2 leaves. 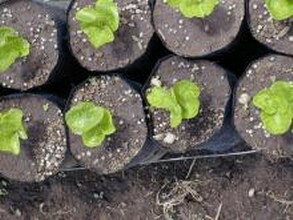 One or two weeks after the plants have broken out of the seed, the seedlings are transplanted in pairs in plastic bag's or directly into the earth in the intermediate growing plot. Usually, the plants stay there one year, until the beginning of the next rainy season. 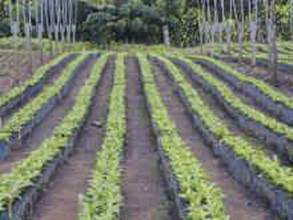 By now, the plants are between 8-12 inches (20-30cm) high and can be replanted in their final location on the farm. 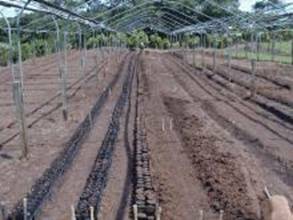 It is necessary to wait for the rainy season, before beginning this transplanting. 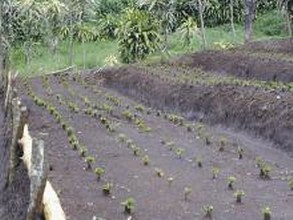 Workers plant the small coffee trees every 4-1/2' apart, in rows that are 9-10 feet apart. 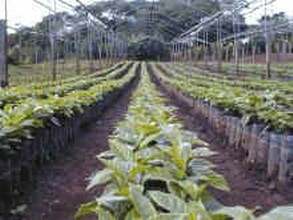 The plants must grow one year more, to the start of the next rainy season. It is now that their first flowers appear, but the plants are still short. The coffee plants are now 2 years old. 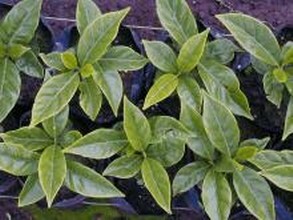 At the end of the third year after planting the seeds, the plants are around 4 to 5-1/2' ft. tall (1.1-1,6m) tall. In the dry season the plants prepare for the flowers. When the first tropical storm arrives, strong enough to water 8" (20cm) deep, the plant gets the power to build out the flowers. Usually eight days after that first rainfall, the white flowers pop out, usually all at one time. 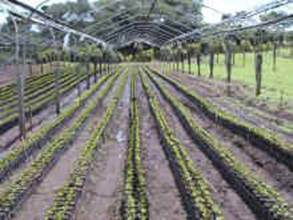 From this time on, the plants need another 8 to 9 months, to bear the ripe coffee cherries in time for picking. For a few days, a wonderful sight and aroma ... like jasmine in the early morning hours ... spreads itself throughout the farm. 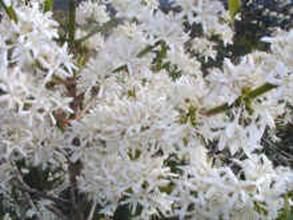 Insects are attracted by the white bloom splendour, in huge numbers. This spectacle is not predictable, and is a mad sight for coffee-interested tourists. So many insects fly all day long from bloom to bloom, causing one to ask them selves where they all came from at once. 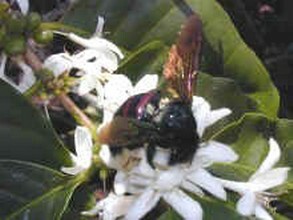 All plants do not come to the same time, and sometimes a plant will bloom at the same time it carries red and green cherries. 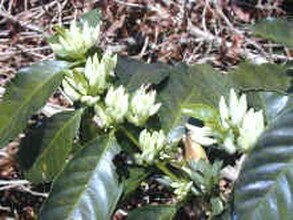 The coffee plantation is flowered white, and the coffee trees hang low, heavily loaded with red coffee cherries waiting for the harvest. 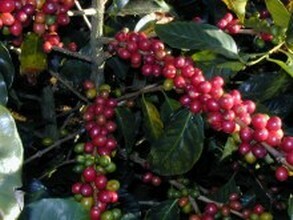 Coffee is traditionally hand picked. In time of harvest thousands farm workers fill the fields. 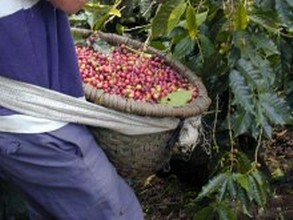 With special care, workers take only completely ripe cherries from the plants for coffee. Thus guarantees a consistently superior quality of bean for further processing. 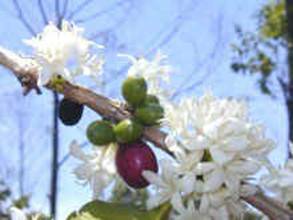 Coffee-picking is not as beautiful as it appears in some advertisements and commercials. 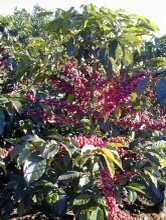 Instead, it is hard, hot work, to pick a basket of ripe coffee cherries. 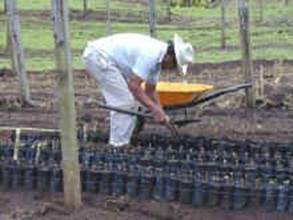 A good worker picks 7-12 baskets a day, depending on the number of ripe cherries remain in the fields. 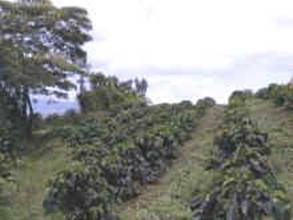 The coffee is transported on the same day in the afternoon from the farm to the factory for processing.